*Thanks to SF and the good folks at Impex Beverages for the sample. With The Arran Malt’s 16 year old coming out soon in the U.S., I thought I’d take a look back at Arran’s entry-level 10 year old expression. I reviewed this a few years ago at a tasting party and while I got good notes then, a generous sample from U.S. importers Impex Beverages has given me a chance to really sit down with this one. Additionally, since Arran is such a young distillery, I thought it might be interesting to see how this one has changed now that a wider range of matured whiskies are available for the vatting. For their 10 year old expression uses a majority of malt that’s been matured in ex-bourbon American oak with some ex-sherry European Oak making up the rest. Also worth mentioning is the fact the Arran does not chill-filter, nor do they add any artificial coloring to this whisky, which definitely makes it a minority among similar younger, lower priced entries. Likewise, the 10 Year old has been bottled at 46% ABV, quite a bit higher than the usual 40% you see with such expressions. The Nose: Crisp fruits and honeyed malt lead the way: juicy green apples and hard Bartlett pears and soft honey whole-wheat bread. Powdered malt, almond bars, and vanilla bean along with a bit of orange zest and lemon panna cotta play a lesser role. Not a lot of wood notes on the nose, a little cut oak and muted baking spice and a whisper of brine. The Palate: Nice creamy/oily mouthfeel with more honey and malt kissed with more apples and citrus. Seems a little “hot”, alcohol-wise, not necessarily off-putting, but it does show its youth on the palate. Unsweetened chocolate and salted nuts lead to much more spice than I found on the nose. Earthy clove, ginger and white pepper grow quite drying and mouth-watering at the same time. Thoughts: A nice, crisp, solid entry-level whisky, this second time around, I found both more complexity and more youth. 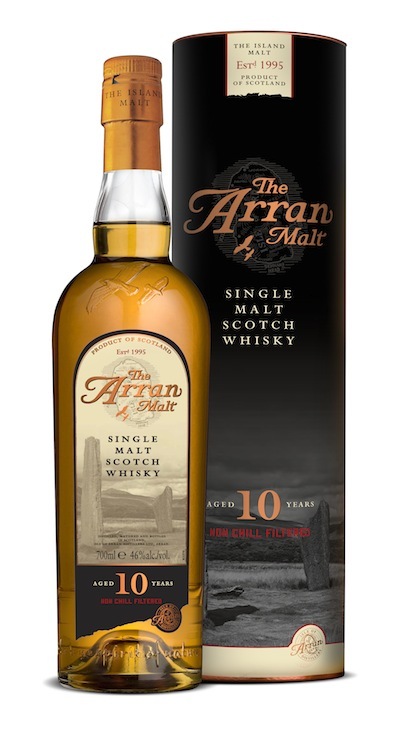 There’s much to appreciate in the Arran 10, the inviting nose is full of honey, fruit, and malt, and the palate does carry some of that over, adding lively spice to the mix. Towards the end, however, its youthful rough edges are a bit more apparent, but that’s also part of its charm. In my first review, I mentioned this might be a perfect picnic whisky, I think I have to amend that by saying this would be a nice summer evening bottle shared with friends. It’s good on its own, and with a bit of water or over ice, some of the harshness is calmed without losing much of the complexity. Also, while it may pain some to use a $45 single malt in this fashion, I also found this to be an excellent Scotch to use in a Rob Roy. If you’re curious about whiskies from The Arran Malt, this is one is a good value and a good place to start.